Item # 310068 Stash Points: 895 (?) This is the number of points you get in The Zumiez Stash for purchasing this item. Stash points are redeemable for exclusive rewards only available to Zumiez Stash members. To redeem your points check out the rewards catalog on thestash.zumiez.com. 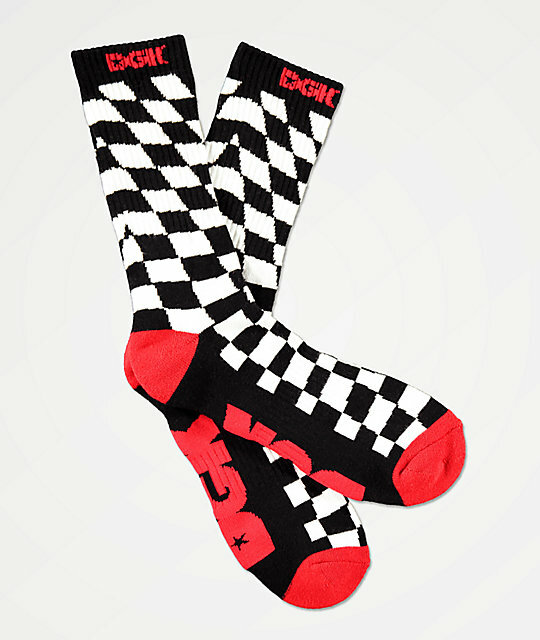 Accent your sock collection with some fresh pattern in the DGK Illusion Checkered Crew Socks. Featuring black and white checkered patterns throughout and DGK script logos at the upper cuff and footbed, these socks are a great way to offer a loud, skate-inspired accent to all your favorite daily looks. Illusion Checkered Crew Socks from DGK. Ribbed upper cuff with jacquard knit DGK logo. Jacquard knit, black and white checkered detailing throughout. DGK logo script jacquard knit into footbeds in red.